The speed of the car is set to 250 km/h. In the case of the drafting cars, the distance between the front of the car that drives ahead and the front of the other car is 5.5m. It means that the cars drive with a distance of around 0.85m. 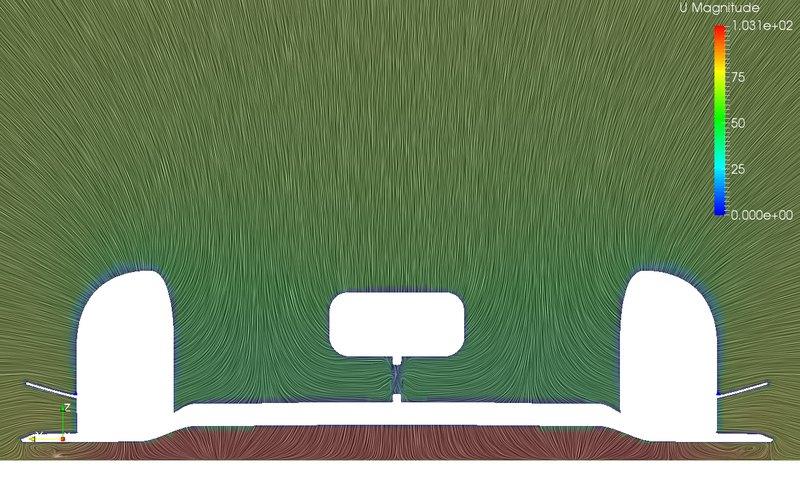 In the case of the overtaking cars, the distance between the cars is 0.25m. For the case with a non-zero Yaw angle, the Yaw angle is set to 10 degrees. 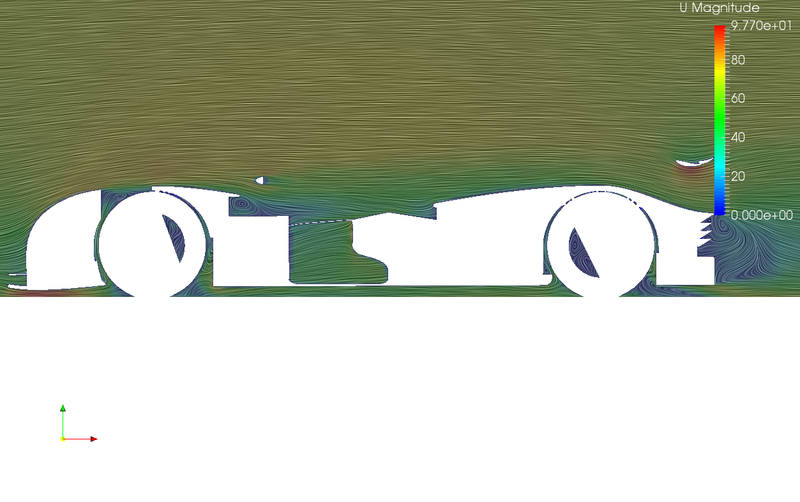 The following picture shows the grid used for a single car. 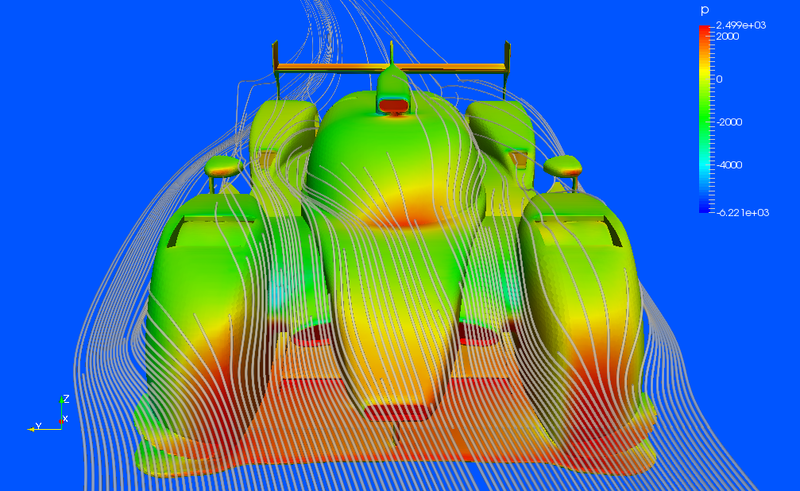 As it is shown in the pictures, in the case of the drafting cars, the streamlines are less curved toward the car that drives behind. This explains a reduction of the downforce exerted on that car. 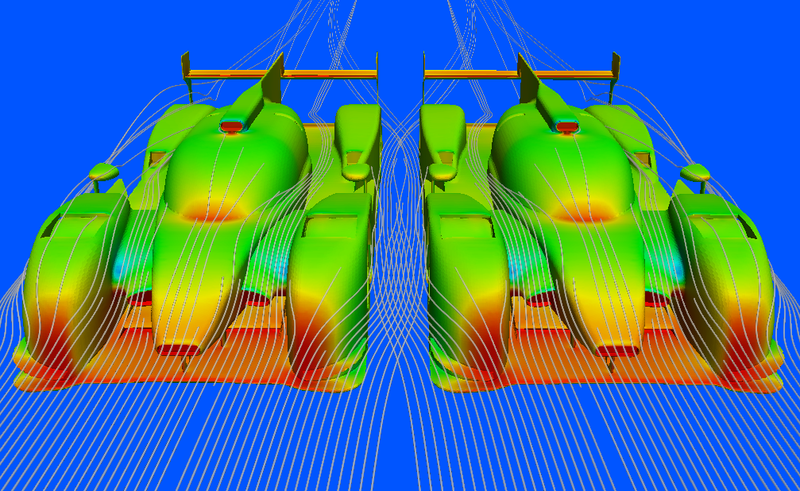 In the case of the overtaking cars, as it is shown in the second pictures, the streamlines of each car in the space between the cars, are deviated toward the other car. This explains the lateral force exerted on each of the cars toward the other car. Hi everyone, I need to correct something in the report. 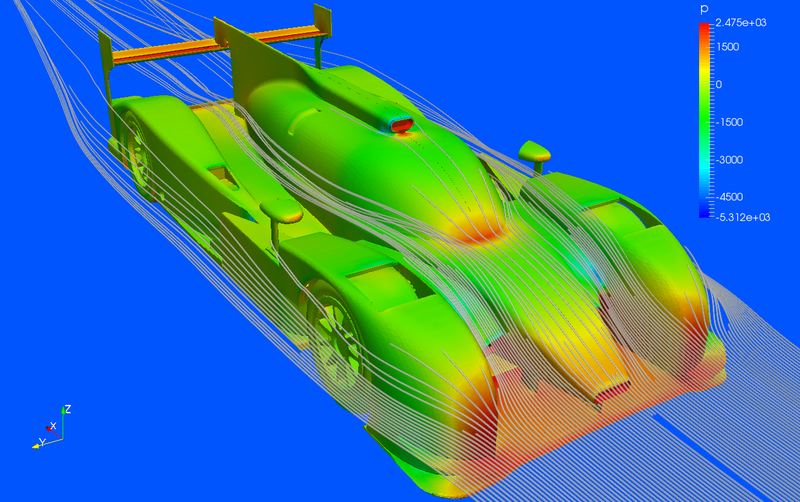 The forces which are calculated for the Single car as well as the drafting cars, are for the half of the bodies. So, you need to double these values. Sorry for the inconvenience! @roozbehmousavi, got it. Thanks for posting the correction! First of all it seems that your simulation is not fully converged. 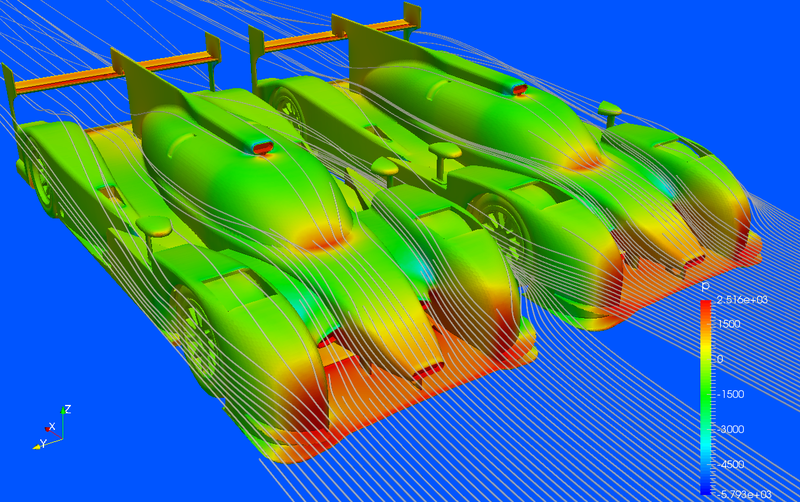 As an example you should take a look at the simulation of “Drafting Cars”. Especially the forcs are not converged already. I would suggest to run additon 1000 iterations. Many thanks for your comments. You are right, the solution for this case needs more iterations. Concerning the grid generations, I had some strange difficulties which were somehow related to the *.stl CAD file, I guess. First of all, I could not extract the edges using a feature angle criterion. 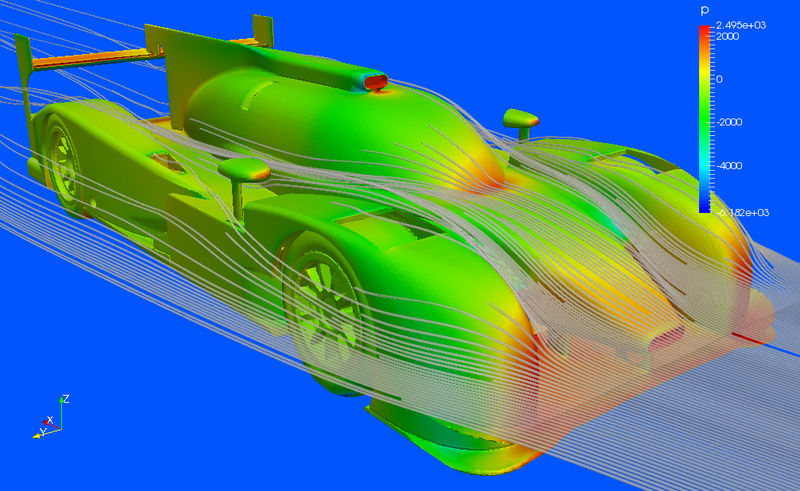 I also could not open the file as a solid body in SolidWorks because of the high resolution and I had to use MeshLab to make two drafting cars. But the problem was that the two cars were exported as a single surface. This prevented to make a surface refinement! It would be great if I could have a *.step file of this geometry. You are absolutely right about the boundary layer mesh. Honestly I did not try that with the coarse grid, but it did not work for the fine grid. I got errors. The bounday layer mesh is very necessary for capturing the separation zone precisely, but there is nothing to do with the transition, in my opinion. For capturing the transition line, one has to use either LES or a transitional RANS model solving a turbulence intermittency equation. 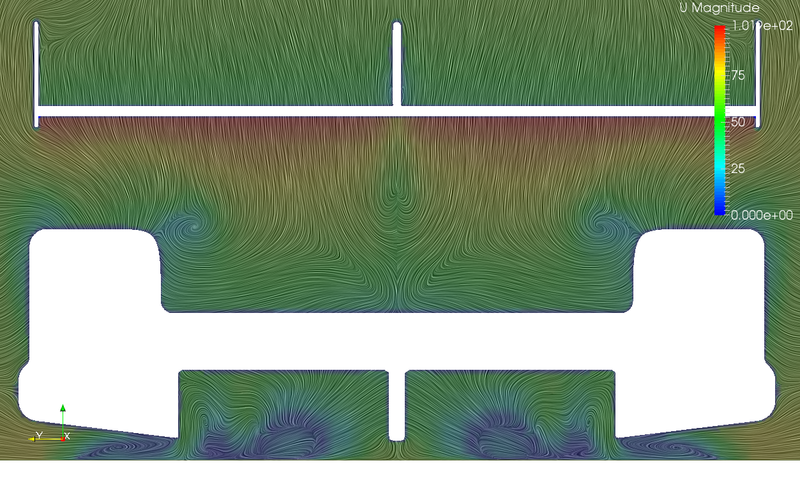 I should also say that I had some stability problems during the flow simulation using the fine grid. 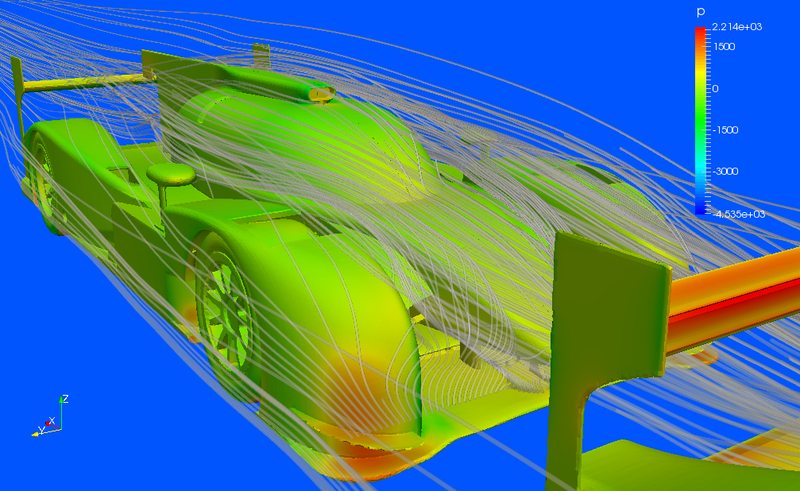 If you look at the grid (https://www.simscale.com/workbench/?pid=1992874712637604373#tab_0-0), you will find it quite nice and you see that all the details of the geometry (for example the space between the wheel and the body of the car) are precisely resolved. 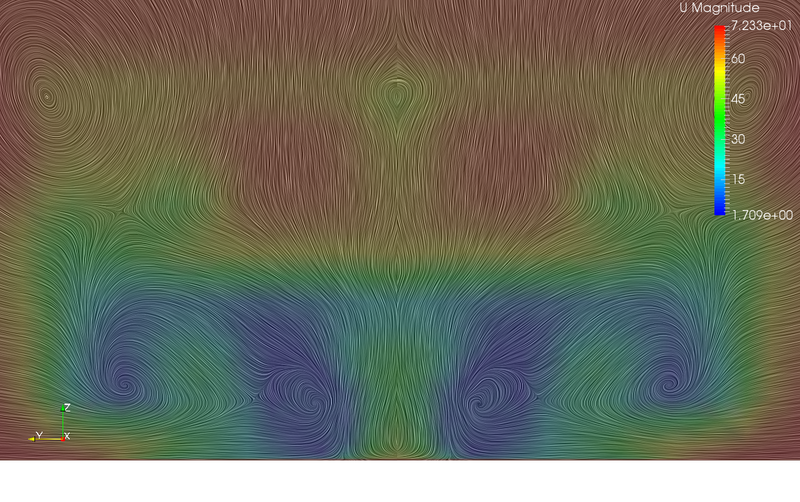 I have no idea what is the origin of the solution instability concerning this fine grid. @roozbehmousavi - awesome post-processing! Great project! (@dheiny ): Thanks Mr. Heiny! I am interested if you can elaborate. It is impossible to diagnose without knowing what instability it is. Hi @dylan , thanks for your interest. It would be great if you try with the fine mesh and let me know about your experience. 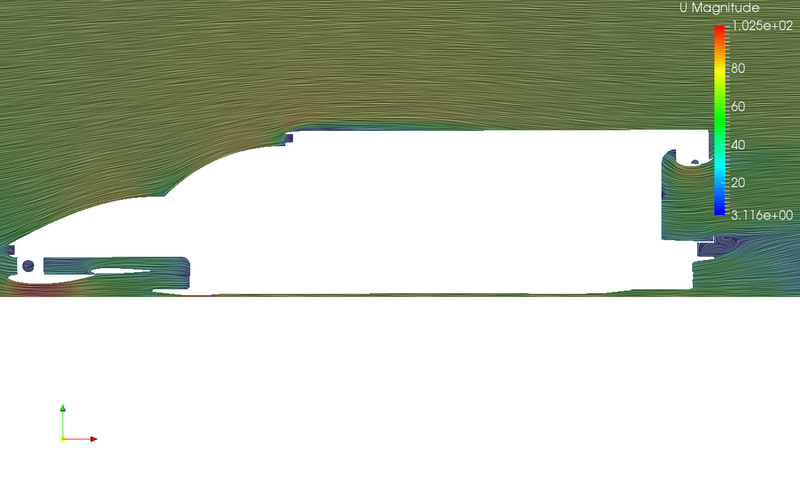 The fine grid looks OK, but the simulation is stopped at the first iteration. 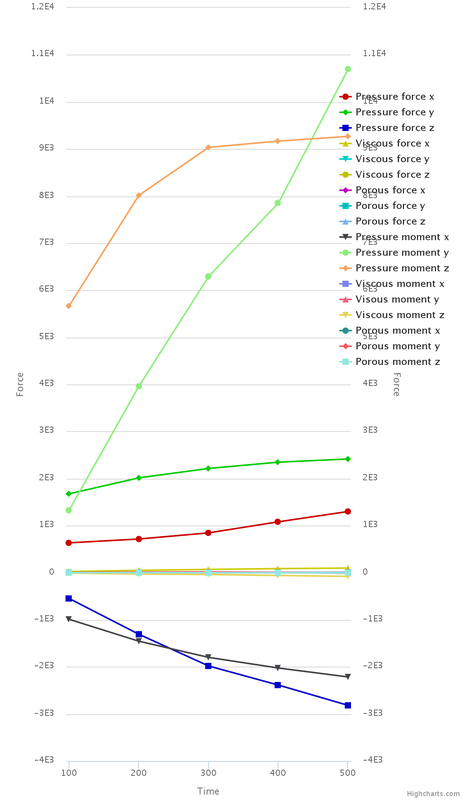 I tried to use lower relaxation factors, but with no successes. It seems that the problem is somehow related to the pressure solver that can not manage to handle such a huge spars matrix. I am looking forward to hear good news from your simulation. Boundary openness (-3.61347e-16 5.91293e-15 -2.25693e-15) OK. Minimum face area = 3.95633e-09. Maximum face area = 0.071144. Face area magnitudes OK.
*Number of severely non-orthogonal (> 70 degrees) faces: 37. ***Number of non-orthogonality errors: 15. ***Error in face pyramids: 74 faces are incorrectly oriented. The more the stars, the worse the problem. But it is I believe the negative cell volumes that kill the job. Boundary openness (-6.24213e-17 3.15063e-16 1.35568e-15) OK.
Max cell openness = 4.33442e-16 OK.
Max aspect ratio = 38.3736 OK. 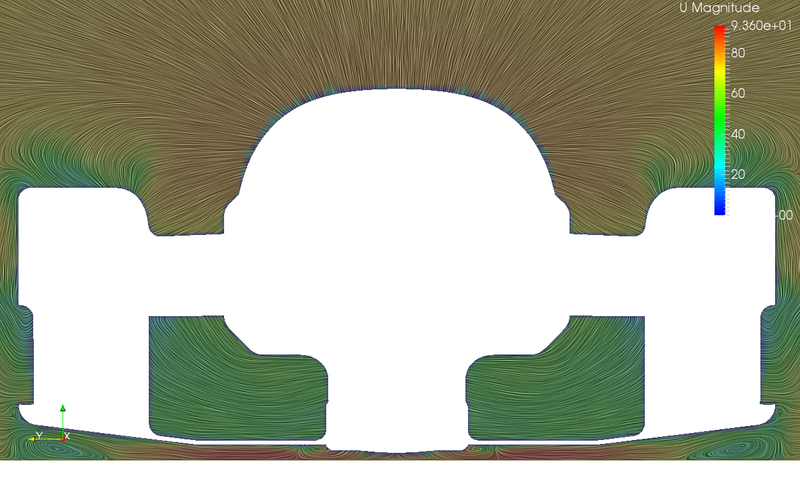 Minimum face area = 1.5103e-07. Maximum face area = 0.273126. 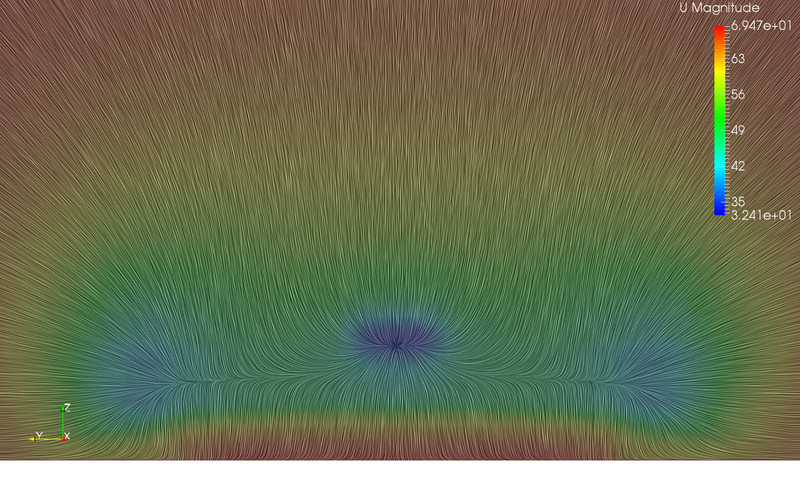 Face area magnitudes OK.
Min volume = 6.08063e-09. Max volume = 0.132627. Total volume = 6068.62. Cell volumes OK.
***Error in face pyramids: 1 faces are incorrectly oriented. 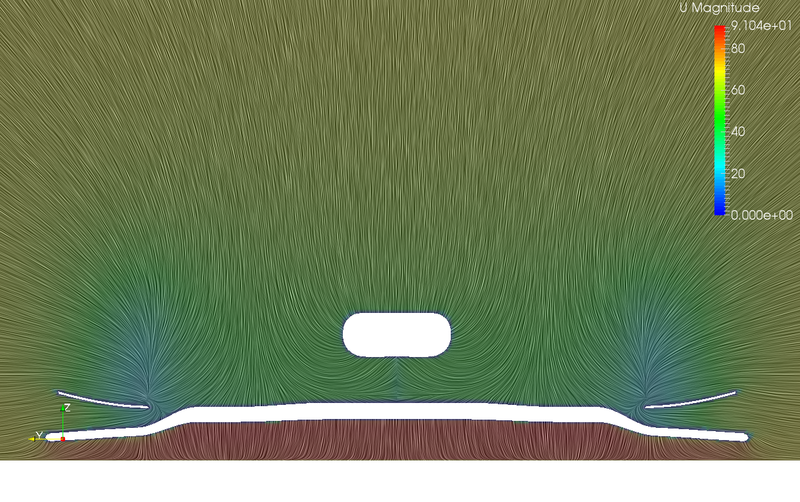 High skewness may or may not affect convergence/accuracy depending where the cells are located. If they are in regions with low gradients they are fine. There is only one wrongly oriented cell, which may also be located somewhere with low field gradients; maybe that’s why the case converged. @dylan - good catch. 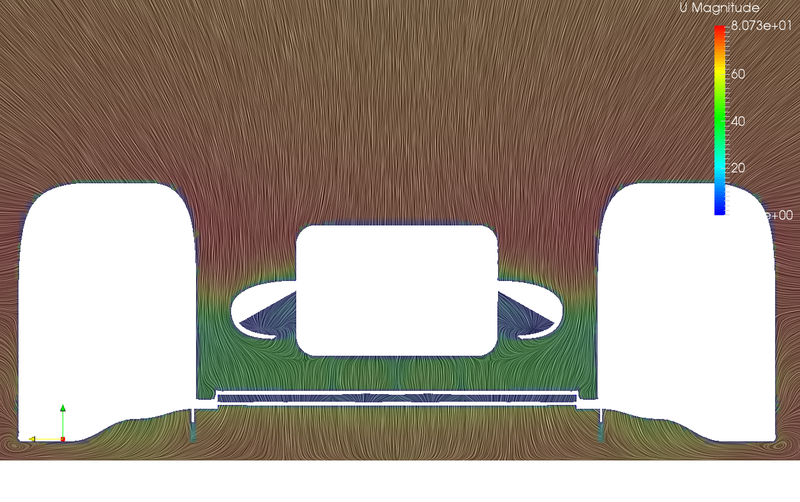 Negative volume cells are indeed a show-stopper for the sim. Now, lets talk about meshing with cut cells. 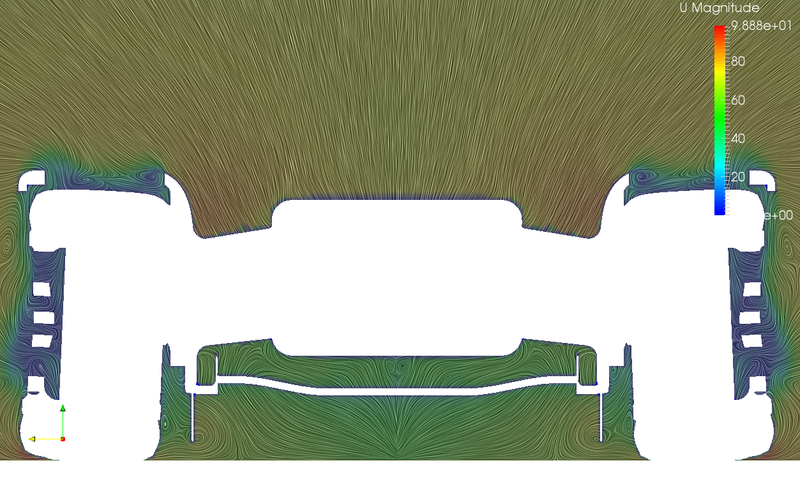 For a complicated geometry like a racing car, you would want to split the stl file into multiple files and apply name-based local refinement. This way you obtain not only a better control over local cell sizes, but also a better capture of important edges as now patches/subsets along with their shared boundaries are recognised by the mesh generator. 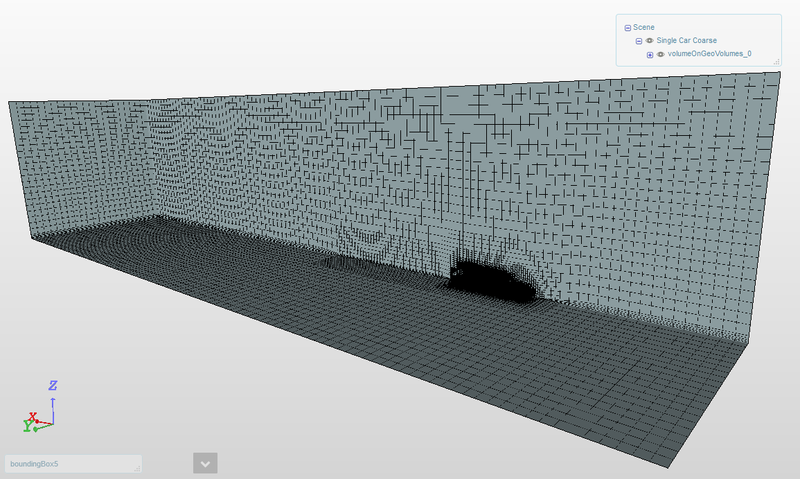 Finally, it is much easier to grow boundary layer cells on a good surface mesh. Currently, surface split is easily done in native OpenFOAM with a collection of its utilities for surface mesh manipulation. 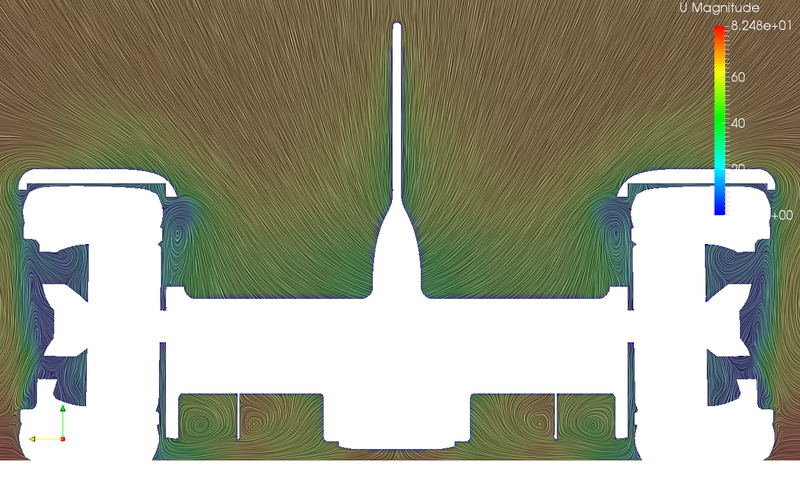 I haven’t noticed such functions on the SimScale platform with a community plan. Boundary openness (-8.18583e-18 -1.60872e-16 -4.17722e-17) OK.
Max cell openness = 4.00464e-16 OK.
Max aspect ratio = 11.5065 OK. Minimum face area = 1.19661e-11. 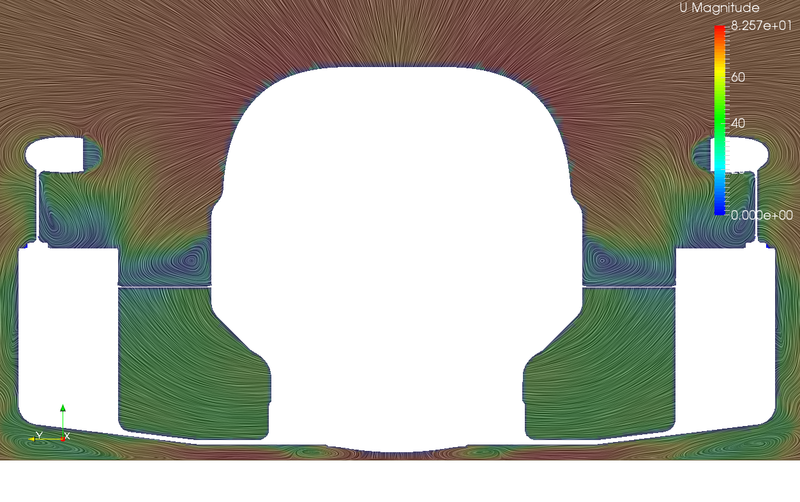 Maximum face area = 0.917718. 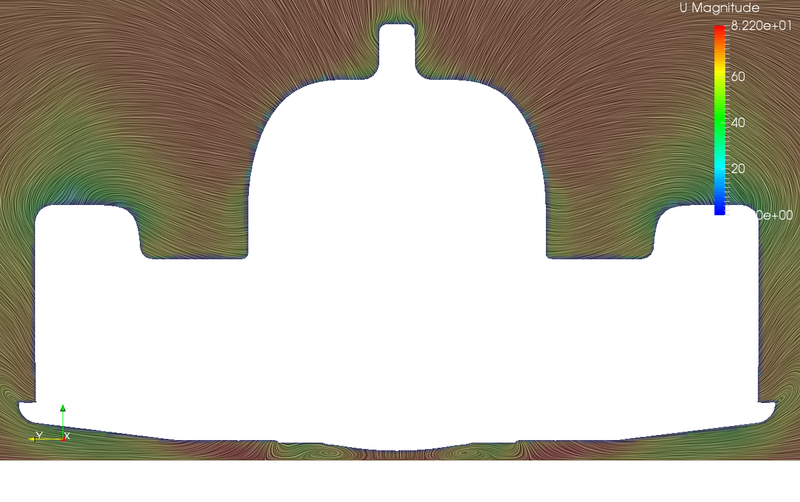 Face area magnitudes OK.
Min volume = 3.38159e-13. Max volume = 0.743455. Total volume = 89.6918. 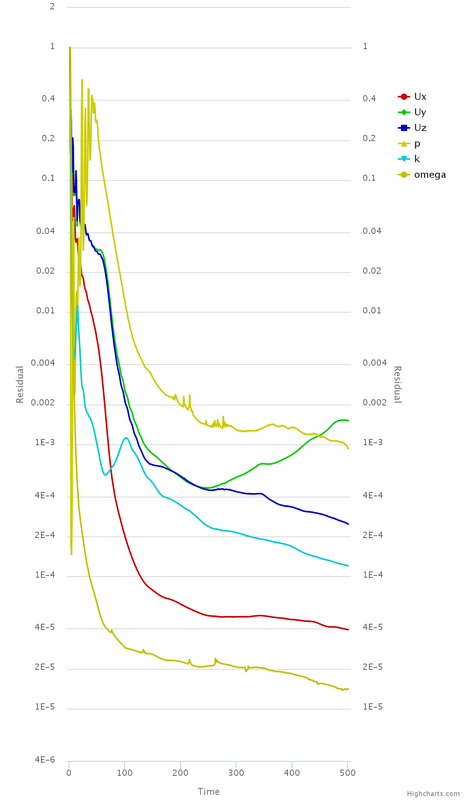 Cell volumes OK.
*Number of severely non-orthogonal (> 70 degrees) faces: 2. Max skewness = 3.68145 OK.
One doesn’t worry too much about non-orthogonality, as corrections can be applied in solvers. Note that no boundary layers have been added, because a set of closely controlled/monitored cell optimisation parameters is required to smooth out those cells. 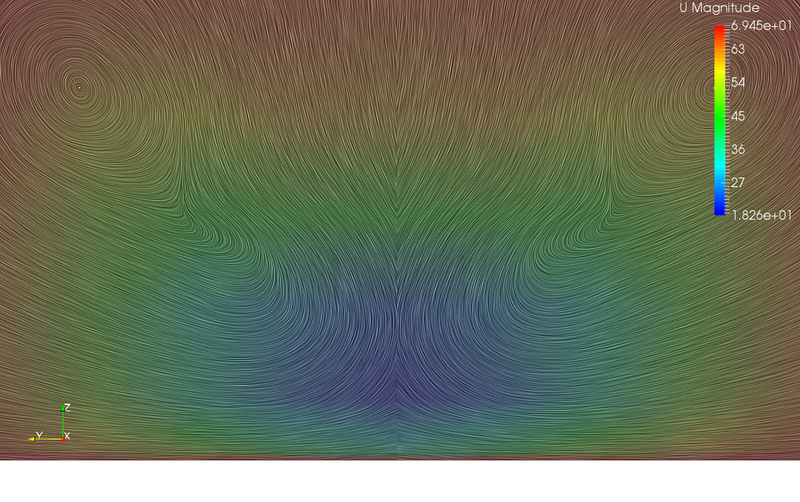 But the main reason it is not done on this particular wing is because there are 800k surface cells, on which if 20 boundary layers are grown, my laptop will not have enough RAM to even visualise the volume mesh ( need at least 10G of RAM to load it ). Boundary openness (3.78916e-19 3.78831e-16 -4.22083e-16) OK.
Max cell openness = 3.48028e-15 OK.
Max aspect ratio = 127.821 OK. Minimum face area = 1.01365e-09. Maximum face area = 1.1977. 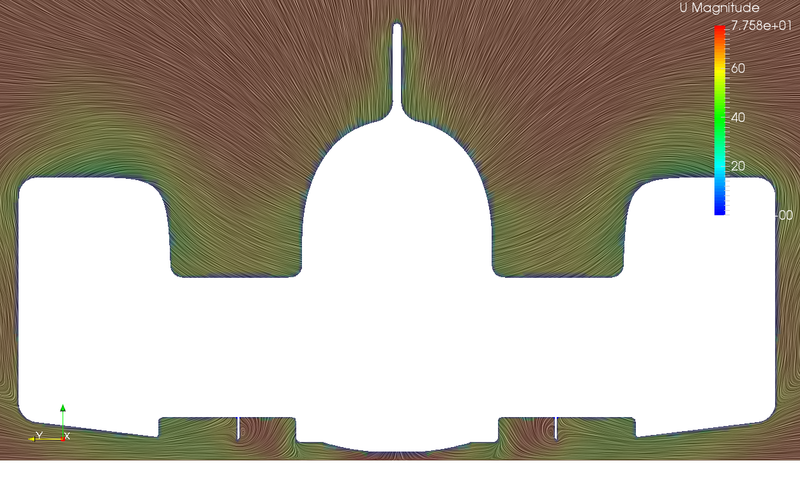 Face area magnitudes OK.
Min volume = 3.18048e-12. Max volume = 1.33059. Total volume = 2399.94. Cell volumes OK.
*Number of severely non-orthogonal (> 70 degrees) faces: 100. Max skewness = 2.90826 OK.
As you can see, a set of clean stl files give you a good surface mesh and from there you may obtain a good boundary layer too. The turbulence parameters k and omega are not either. A reduced tolerance is desired. 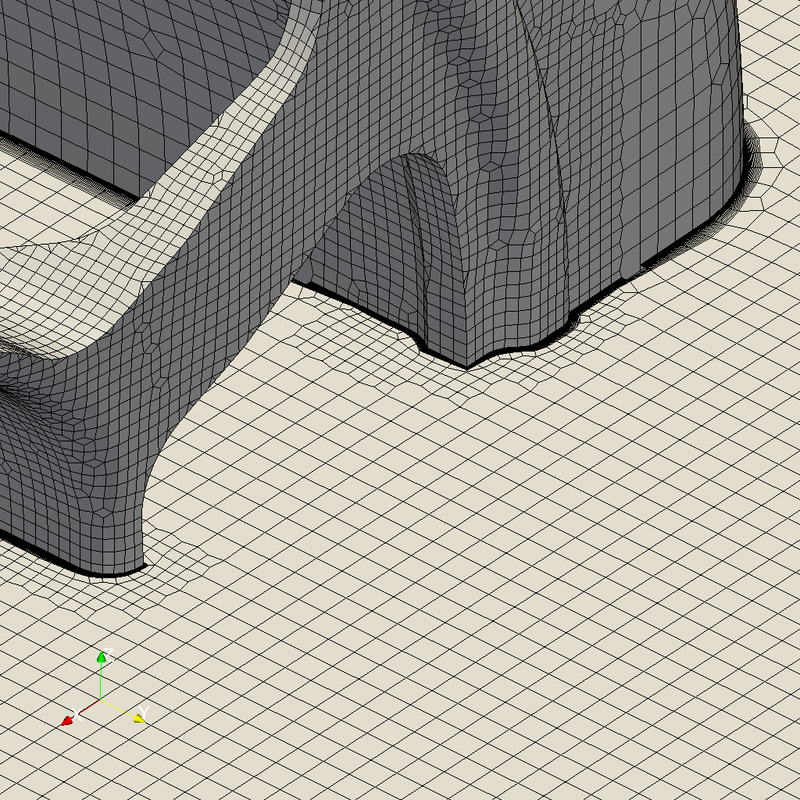 Working with NURBS models: Agreed - let the CAD system do, what it can do best. So if you’re working in a BREP modeler, you can also upload the STEP model such that SimScale will take care of the tessellation if necessary. @dylan - forgot to mention: keep the feedback coming, we’re eager to improve the workflow! Thank you for those images. I didn’t notice those features. 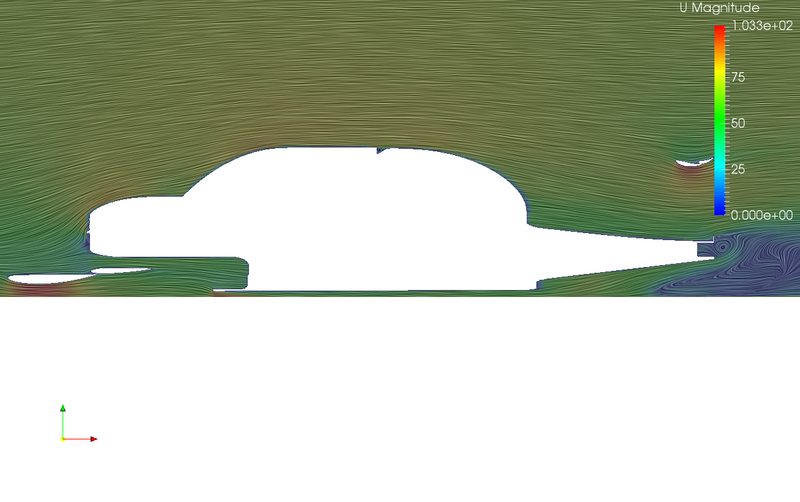 Now about my unstructured meshes. 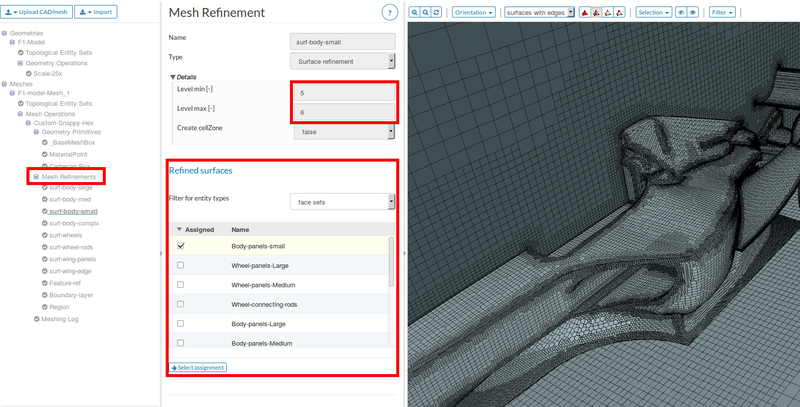 I am using both SnappyHex and cfMesh, the latter being another open-source mesh generator for OpenFOAM. 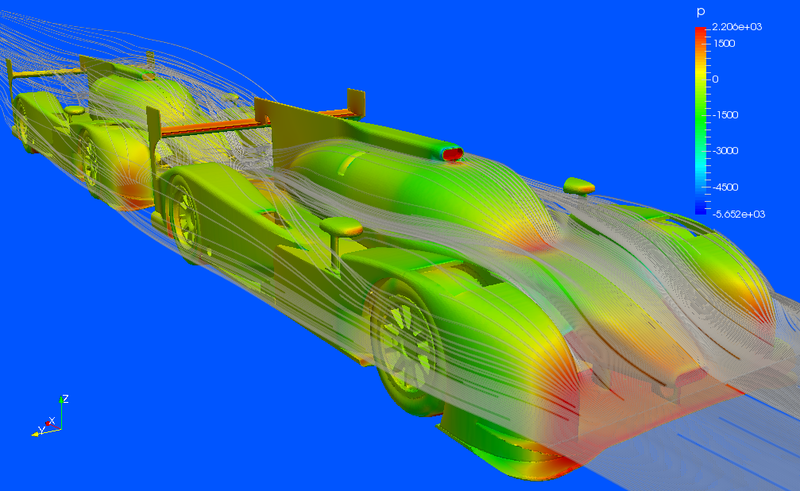 The wing was created in SnappyHex and the wheel with boundary layers cfMesh. They both provide cut cells and are easy to implement. However, cfMesh has been a lot faster and more efficient for me despite less control entries in its mesh dictionary. SnappyHex allows for more parameter tuning in the mesh dictionary and some of those features are very useful in complicated cases. Sorry the images of the wing were also from cfMesh, but I do have the same wing meshed by SnappyHex and was equally good. About the geometry split, a GUI environment is easy to be made a meshing Swiss knife. There are a brunch of STL manipulation utilities in OpenFOAM. One can use surfaceAutoPath name.stl newName.stl [angle] to split one large STL file into multiple parts within the same file. From there, executing surfaceSplitByPatch newName.stl will turn the one large file into multiple STL files, each containing one patch as split before. Now, with the GUI environment, one can go ahead and rename, delete, or combine those STL files. Finally, it is not hard and useful to combine all the patches into one STL file that contains all the individual names by using cat name* > newerName.stl. Now, the amount of new patches generated by surfaceAutoPatch can range from 2 to 20000, depending on what angle is chosen and how clean the surface mesh is. With a dirty STL file, which is almost always the case, one will easily end up dealing with a few thousands of STL patches. This is where a GUI environment is highly appreciated, as it allows visual/manual interactions. 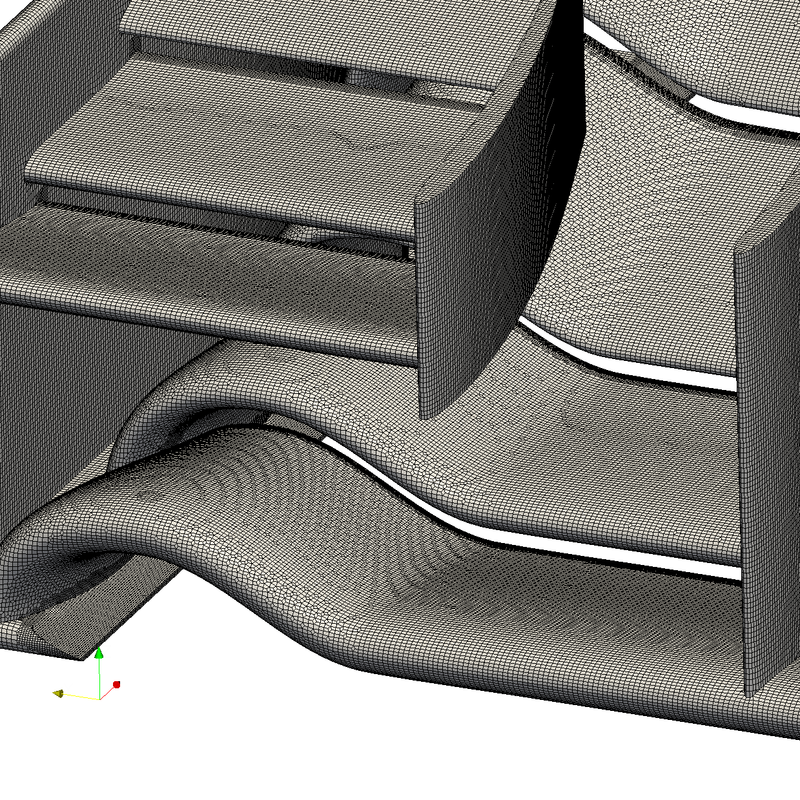 The above is only a small section of the surface mesh utilities that come with the OpenFOAM release but can potentially provide significant improvement in meshing efficiency, and reduced CAD usage. The wheel mesh I uploaded was purely done with the STL manipulation utilities mentioned above in a TUI environment/Paraview, as there are only a few patches/shared edges that need to be recognised by the mesh generator. @dylan - yes, these OpenFOAM manipulation utils are indeed neat. 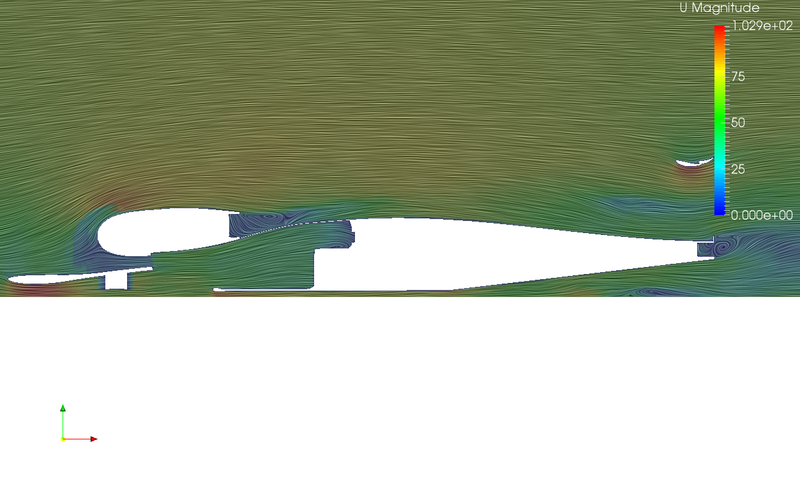 However most of the users here prefer to work with the actual NURBS model (e.g. 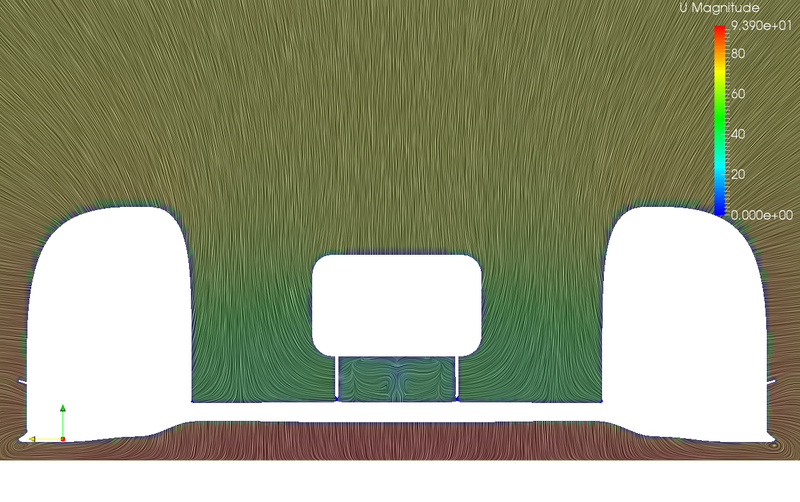 STEP, IGES) where surface-splitting and merging is not relevant. 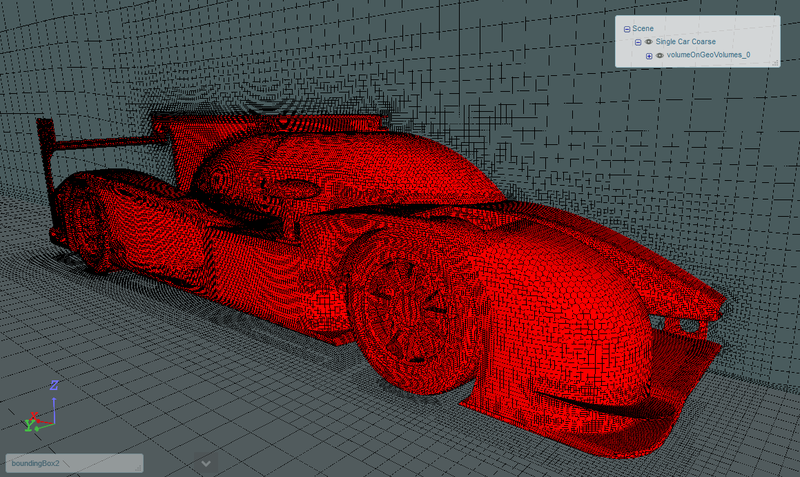 By definition you can address the entire topology of those models, also during snappyHexMesh setup. But it seems that you prefer to work with the faceted model. Is there a specific reason for this? Do you want to have full control over the surface tessellation? I havent used stp/iges here and didn’t think I saw any public projects done that way. Could you please link me to one example as such? 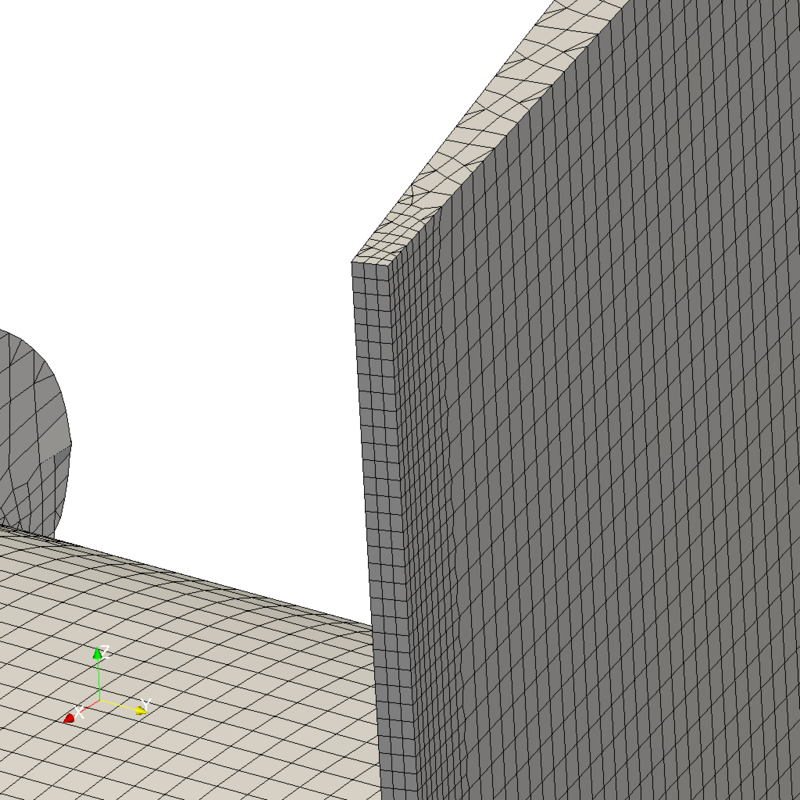 I would like to see how local refinements are applied when meshing with stp/iges. There are two reasons I would like to split a geometry. 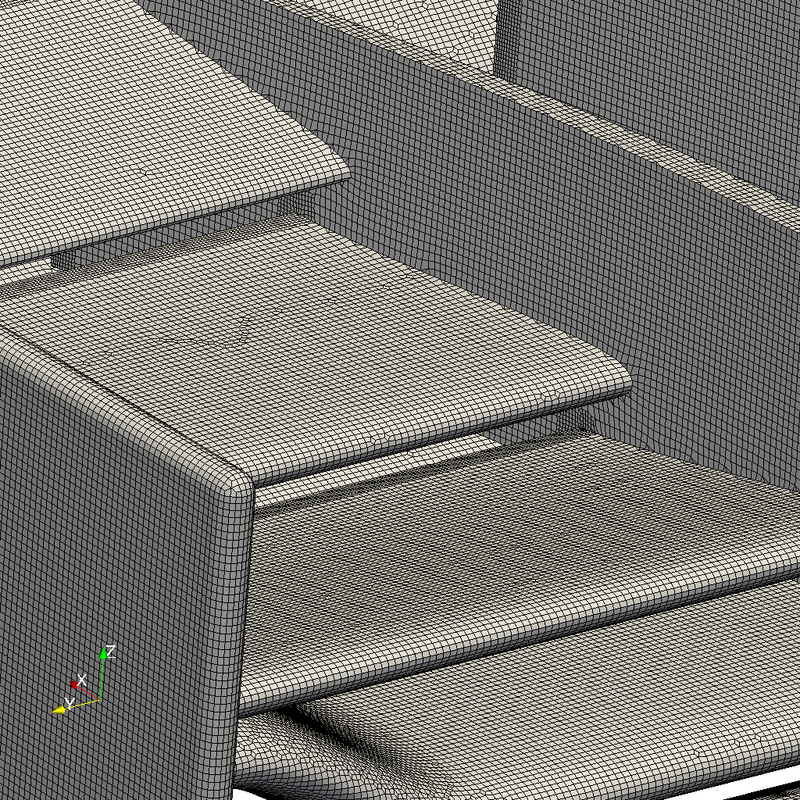 Firstly, it is possible to capture all the important edges as all the patches and their shared boundaries are stored in the combined surface mesh file. Secondly, working with different patches is useful when saving computation power is desired as I gain full control over local cell size. 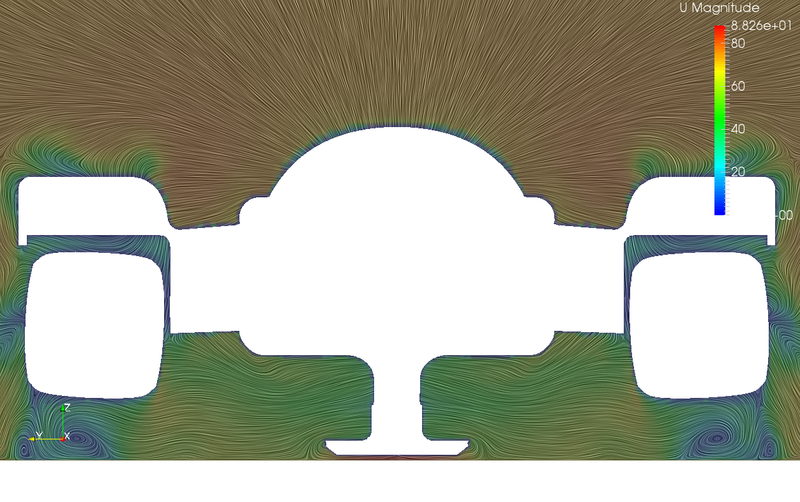 If the same goals can be achieved with stp/iges through different meshing approaches, then why not.